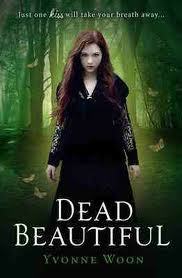 This is the sequel of the book DEAD BEAUTIFUL. The biggest premise of the series is that children (up to age 21) who die and are not buried nor burned will reanimate after 10 days. they will retain memories from their former life and still be functional yet are quite different. their senses will be dull and they will be emotionally detached, apart from having very cold skin. The Undead can only live up to 21 years after reanimation unless they can find their lost soul, which is virtually impossible. And one kiss from them will mean a stolen soul and death. Renee Winters’ parents died after being kissed by the undead. She gets shipped off by her grandfather to Gottfried Academy where she meets mysterious and gorgeous Dante Berlin. She falls deeply in love with him only to find out that he is an Undead. While she on the other hand is a Monitor, a person who can sense the dead and is tasked to kill them if necessary. Circumstances happen and she willingly kisses Dante to give him her soul and die herself. 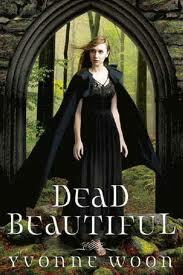 But at the end of Dead Beautiful, Dante sacrifices his new life to give Renee back hers. 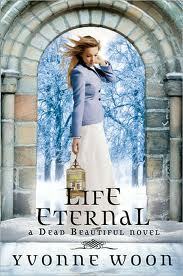 Life Eternal starts with Renee not quite herself anymore. She died and lived again because of Dante, but in the process literally lost a big part of her soul to him, and as such they have become one entity, only fully alive when with each other. She knows that the only chance they have at life together is if Dante finds eternal life. Another problem is that Dante is on the run from Monitors who are hunting him down as they are convinced that he killed the former headmaster at Gottfried Academy. 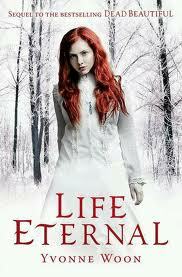 But rumors abound about the Nine Sisters who are believed to have discovered the secret to living forever. So Renee searches for clues that may lead to eternal life….or death. I love the character of Dante. He is strong and loyal. And even though at a certain point in the book Renee starts wavering on her trust in him, he never lost his faith in her. Renee on the other hand is confused. Certain events, and deaths in the book point towards Dante and since he chooses to remain silent about his activities while on the run and his whereabouts, Renee has reasons for her questions. There’s also Noah, another Monitor who is a really good and supportive friend to Renee. But he wants more than what she can give….. because in the end, there is always Dante. This is a good read. although it’s quite lengthy, I didn’t really notice time pass as every chapter drew me in more. the pace is just right and as expected, the ending left me hanging. It left me frustrated about Noah (the ice! The ice!) and hopeful about Dante and Renee. It also left me with questions, the biggest being: will one truly have to die for the other to survive? Let’s ponder this one ladies until the next book comes out. Till then, read these with a tissue or two….